On an earlier blog this summer I posted about planning your vacations to be spontaneous. This takes the planning spouse and the spontaneous, go-with-the-flow spouses’ strengths into consideration. Vacation is a time to reconnect, to chill, to replenish your spirit, create memories, have unique experiences, and have many moments of “ahhh”. Ahhh as in relax and Ahhh as in to worship, to wonder, to marvel. You see the same thing every day and the familiar loses it’s surprise. Hit a new place with new sights and sounds and smells and even the feel of the wind can bring back that sense there is more to life than your next appointment or project or deadline. If we don’t plan we won’t have anything to do or we’ll argue about what to do. If we are too spontaneous you’ll run out of underwear. I mentioned in my earlier blog about our Memorial Day weekend camping trip at Volga River State Recreation Area we had few plans: 1) visit and bike Decorah, Iowa; 2) Try my new smoker; 3) Chill. 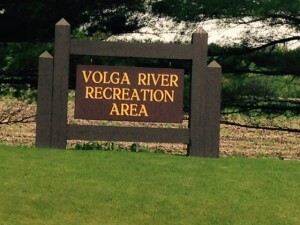 We chose Volga River because we wanted to camp in NE Iowa, a very beautiful part of the state. We hadn’t explored that are much before. Also, the area was only 2 1/2 hours away from our house, a perfect distance to be gone just a few days. It turned out the campsite was wonderful and the camping area was completely new. This sign greets you as you enter the park, 5000 acres of woods and open space, a lake and two rivers and two campsites and miles and miles of trails. This is our campsite. Very spacious and open, bigger than most commercial and state campgrounds with trees and open space, the perfect combination. 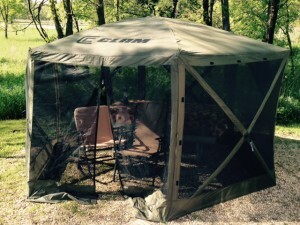 Our new Clam Screen Tent. It only takes 30 seconds to put up. Amazing! I’ll have to have more on a later blog about our Clam Screen Tent. We visited Decorah as we planned, but the day there was pretty wide open. 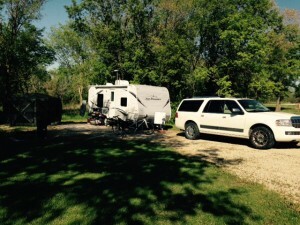 Decorah was 35 miles away from Volga River, close enough for a day trip from our campsite. Friends had recommended a place for lunch, called Ruby’s. We happened by it about lunch time so decided to go there for lunch. Our waitress was the owner and spoke highly of her roast beef dinner, saying they make their own bread, mash their own potatoes and oven roast their own meat each day. Very nice to have real mashed potatoes! If you put this place on your agenda, you’ll have to hit it before 2 PM as they are only open for breakfast and lunch. We putzed around downtown Decorah some as there were some cute shops, my wife’s favorite. I make sure I bring my Kindle or iPhone to have something to read if I get tired of shopping. I get to relax and my wife has a ball. Both our needs are being fulfilled on that deal, a win-win. We checked out the store for the Norwegian Museum. We’re both from Minnesota and have a little Norwegian blood in our heritage somewhere, plus with our Minnesota roots we’re familiar with many of the artifacts. That was fun. 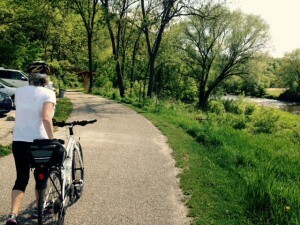 Then we biked the Trout River Trail, which is an 11-mile trail around the outskirts of Decorah. 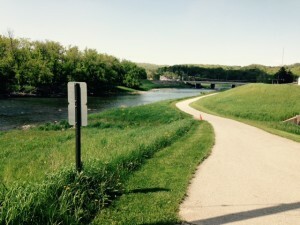 It follows the Trout River on one side of town and then goes into the bluffs on the other side. Since this was earlier in the year, we weren’t quite ready to hit the hills, but the trail along the river was beautiful. Most of the trail was right next to the river, making for beautiful scenery. Looking over my wife’s shoulders. You can see the trail goes through the woods on one side and the river is on the other. On most trips we like to find the best local pizza. With the Internet we can do a little research. I like the Pizza joints that have been around the longest. They’ve proven they have a formula the locals love and there’s a good chance we’ll like it, too. It’s been a 40 year quest in our marriage and a fun option to have as a “thing to do” on vacation. We prefer thin crust. I grew up on thin crust pizza from Mr. Pizza in Rochester, Minnesota (still there and still my favorite), near where I grew up, and Carbone’s in White Bear Lake near where my cousins lived (and still a stop now when we visit extended family in the area. There’s over 30 locations in Wisconsin and the Twin Cities). For supper in Decorah we chose a locally owned pizza restaurant that had a long history (since 1953!) called Mabe’s. It was a walk back in time, just the way we like it. My wife and I have a running conversation about the new decor in fast food restaurants. It’s like they don’t want to you relax or enjoy yourself and want you to leave as soon as possible. It has the opposite affect on me: making me not want to go in the first place. The old, warm woods are fine for me. I wouldn’t say Mabe’s was the best pizza we’d ever had, but it was pretty good, good enough to give us a high-five on our food choices that day. We had only one thing planned this day: to hit the Trout River Trail. The rest of the time was used to just enjoy the new sights and sounds and see what interested us. It included a trip to Ace Hardware in Decorah to pick up some things for camping and to Wal-Mart to buy some more water hoses for our camp site so we wouldn’t trip over the hoses to our water supply for our trailer. We got back in plenty of time to relax and chill before some of our family arrived the next day, a perfect blend of planning and being spontaneous. In the next blog in this series we’ll look at resurrecting a vacation rain day. To see the first blog in this series click here.